ALL SALES REFUNDS WILL BE REFUNDED AFTER ORDERS HAVE BEEN PROCESSED. 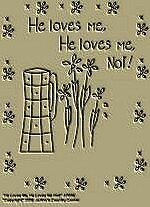 #A141 Primitive Stitchery Pattern Primitive "He loves me, He loves me not!" Primitive Stitchery Pattern Primitive "He loves me, He loves me not!" measures 6 1/4"x8 1/4". 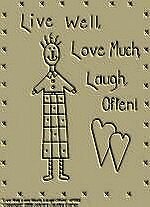 #A142 Primitive Stitchery Pattern "Live Well, Love Much, Laugh Often!" Primitive Stitchery Pattern "Live Well, Love Much, Laugh Often!" measures 6 3/4"x9". 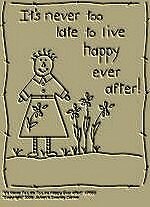 #A143 Primitive Stitchery Pattern "It's never too late to live happy ever after!" Primitive Stitchery Pattern "It's never too late to live happy ever after!" measures 6 1/2"x8 1/2". #A154 Primitive Stitchery Pattern "Snowman Heart & Snowman Star Towel Patterns/ Quilt Applique Patterns!" "Primitive Stitchery Patterns "Snowman Heart & Snowman Star Towel Patterns/ Quilt Applique Patterns!" These 2 patterns can be used for Towels, Quilt Appliques, or Primitive Ornies! The Heart measures 3 3/8" widem 3 1/2" long, the star measures 4" wide, 4 1/2" long. #A155 Primitive Stitchery Pattern "Heart'n Sheep & USA Star Towel Patterns/ Quilt Applique Patterns!" "Primitive Stitchery Patterns "Heart'n Sheep & USA Star Towel Patterns/ Quilt Applique Patterns!" These 2 patterns can be used for Towels, Quilt Appliques, or Primitive Ornies! The Heart measures 3 3/8" widem 3 1/2" long, the star measures 4" wide, 4 1/2" long. #A156 Primitive Stitchery Pattern "Colonial House Heart & Wreath'n Star Towel Patterns/ Quilt Applique Patterns!" "Primitive Stitchery Patterns "Colonial House Heart & Wreath'n Star Towel Patterns/Quilt Applique Patterns!" These 2 patterns can be used for Towels, Quilt Appliques, or Primitive Ornies! The Heart measures 3 3/8" widem 3 1/2" long, the star measures 4" wide, 4 1/2" long. 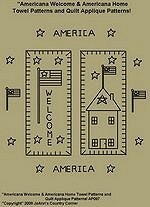 #A157 Primitive Stitchery Pattern "Americana Welcome & Americana Home Towel Patterns/ Quilt Applique Patterns!" Primitive Stitchery Pattern "Americana Welcome & Americana Home Towel Patterns/ Quilt Applique Patterns!" These 2 patterns can be used to for towels, quilt appliques, ornies, bowl fillers and book markers! Measurements are 2 1/4" x 5 1/8". #A158 Primitive Stitchery Pattern "Primitive Mitten & Country Heart Towel Patterns/ Quilt Applique Patterns!" Primitive Stitchery Pattern "Primitive Mitten & Country Heart Towel Patterns/Quilt Applique Patterns!" These 2 patterns can be use for towels, quilt appliques, ornies, and bowl fillers. Mitten measures 3 1/3"x 4 1/4", Heart measures 3"x 4 3/8". #A159 Primitive Stitchery Pattern "Americana Snowman & Snowman w/Heart Towel Patterns/ Quilt Applique Patterns!" Primitive Stitchery Pattern "Americana Snowman & Snowman w/Heart Towel Patterns/Quilt Applique Patterns!" These 2 patterns can be used for towels, quilt appliques, ornies, bowl fillers and book markers! Measurements are 2 1/8" x 5 1/8". 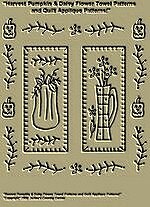 #A160 PrimitiveStitchery Pattern "Harvest Pumpkin & Daisy Flower Towel Patterns/Quilt Applique Patterns!" #A101 Primitive Stitchery Pattern "Saltbox House with Stars Shelf Scarf Pattern!" Primitive Stitchery Pattern "Saltbox House with Stars Shelf Scarf Pattern!" This shelf scarf pattern can be used to decorate shelves, for candle mats, or to line baskets. Measures 5 3/4" x 7 7/8". For larger shelves, you can place more than one Shelf Scarf side by side. #A163 Primitive Stitchery Patterns " Raggedy Anne Shelf Scarf Pattern!" Primitive Stitchery Pattern "Raggedy Anne�Shelf�Scarf Pattern! "�This shelf�scarf pattern can be used to decorate�shelves, for candle mats, or to line baskets. Measures 5 3/4" x 7 7/8". For larger shelves, you can place more than one Shelf�Scarf�side by side. #A164 Primitive Stitchery Pattern "Primitive Heart'n Flowers Shelf Scarf Pattern!" Primitive Stitchery Pattern "Primitive Hearts'n Flowers Shelf Scarf Pattern!" This shelf scarf pattern can be used to decorate shelves, for candle mats, or to line baskets. Measures 5 3/4" x 7 7/8". For larger shelves, you can place more than one Shelf Scarf side by side. #A166 Primitive Stitchery Pattern, "Simplify Candle!" Shelf Scarf Pattern! #A167 Primitive Stitchery Pattern "Joyful Snowman!" Shelf Scarf Pattern!" #A168 Primitive Stitchery Pattern "Americana Stripe Star!" Shelf Scarf Pattern! 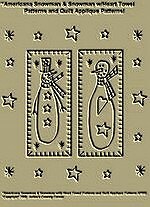 #A169 Primitive Stitchery Pattern "Angel and Stars!" Shelf Scarf Pattern! #A170 Primitive Stitchery Pattern "Think Snow Snowman!" Shelf Scarf Pattern! #A171 Primitive Stitchery Pattern " Apple Pie!" Shelf Scarf Pattern! 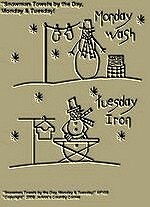 #A174 Primitive Stitchery Pattern "Snowman Towels by the Day, Monday Wash & Tuesday Iron! Primitive Stitchery Pattern Towels by the Day, "Monday Wash, Tuesday Iron!" Great patterns to stitch!